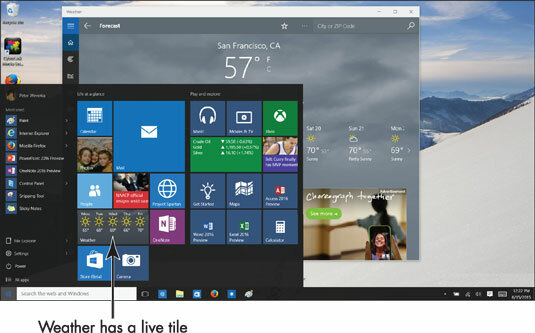 Windows 10 apps are modern looking and rich with information. They are designed to work with touchscreens as well as with a mouse. 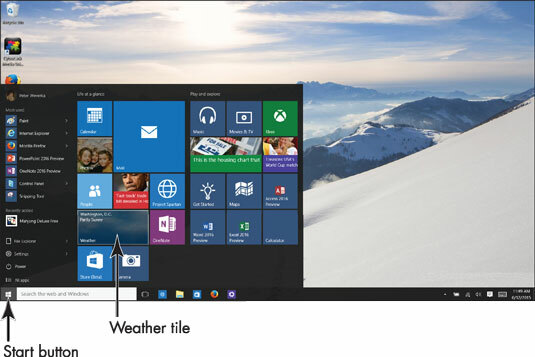 The Weather and Travel apps are two of the apps that appear on the Windows 10 Start screen as tiles. Select the Start button. Selecting this button opens the Start screen. You can also open the Start screen by pressing the Windows key. Use the mouse or a finger to select the tile labeled Weather. The Weather app opens, as shown. It shows the current temperature and weather forecast for your default location. Select the Show Options button. As do most apps, Weather has a Show Options button in the upper-left corner. Select this button to expand the app bar and see the names of options on the app bar. Select the button again to collapse options on the app bar. The first time you open the Weather app, a Welcome screen appears. It asks whether you want to show temperatures in Fahrenheit or Celsius and what your default location is. By default location, the Weather app wants to know where you live, or, if you’re a vagabond, where you spend the majority of your time. Enter a city or town name in the Search box, and from the menu that appears as you type, select the name of the town or city that you call home. You can always change these settings by selecting the Settings button in the app bar and choosing options on the Settings screen. Tap or click the Start button. Focus on the method you think is easiest. However, keep in mind that alternative methods of controlling your computer are always available. On the Start screen, check to see whether the Weather tile is displaying current weather information. The Weather app has a live tile. As with the News app and the Money app, the Weather tile app on the Start screen displays changing information. Switch back to the Weather app by selecting its tile with the mouse or your finger. The Weather app reappears. Switch back to the Start screen. Select the Travel tile (look for a suitcase icon). The Travel home screen appears, as shown. If the Travel tile doesn’t appear on your Start screen, select All Apps to display app names in alphabetical order, and then scroll in the list of apps to the Travel app tile and select it. Mouse: Drag the scroll box at the bottom of the screen to the left or right. If your mouse has a wheel, you can also turn the mouse wheel to scroll. Touchscreen: Swipe the screen to the left or right. Switch to the Start screen by selecting the Windows button or pressing the Windows key. 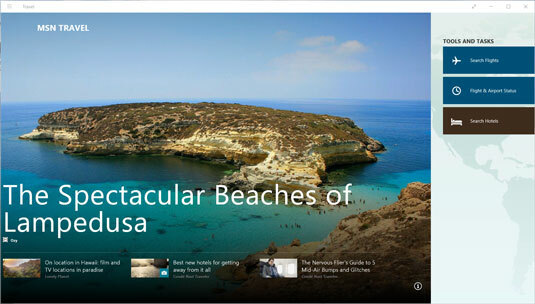 Note that the live Travel tile (if it appears on your Start screen) shows changing destinations. 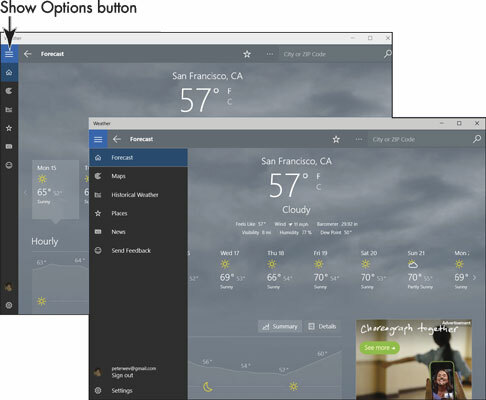 On the Start screen, select the Weather tile. Switch back and forth between the Weather app and the Start screen a few times to get comfortable with switching between an app and the Start screen.